With global population projected to grow nearly 30 percent by the middle of the century, Sam Allen recognizes the challenges facing John Deere & Company. The company’s ninth CEO also sees great opportunities. Hunger, poverty and the environment will accompany the demographic changes. Those changes bring increased demand for agricultural products, farm mechanization and the equipment needed to build a sustainable infrastructure. Deere will continue to cultivate relationships with education and research partners that align with its needs both in the U.S. and in developing countries. 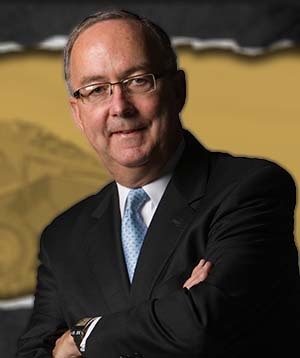 Allen earned his Bachelor of Science degree in Industrial Management from Purdue’s Krannert School of Management in 1975 and joined John Deere after graduation. He moved up the corporate ladder, taking on positions of increasing responsibility in Deere’s consumer products, construction and forestry, power systems and worldwide agricultural divisions, including managing operations in Latin America, China and East Asia, and Australia. A senior officer of the company since 2001, Allen was appointed president and CEO in 2009 and has served as chairman and CEO since 2010. John Deere’s commitment to building a diverse, engaged and skilled workforce includes the promotion and advancement of STEM (science, technology, engineering and mathematics) education, beginning at the K-12 level. In 2011, Allen led the introduction of the John Deere Inspire Program, a global initiative designed to stimulate a future generation of innovators through STEM education combining connections and hands-on experiences with the real world. “We consider STEM literacy increasingly important for students at all levels to support 21st century learning and jobs, regardless of their career choice, but if you don’t have a good background of STEM skills coming out of high school, it’s pretty hard to change that at the college level,” Allen said.